Elizabeth George, New York Times best-selling author of the Inspector Lynly crime novels, first visited The Kings English (TKE) in Salt Lake City 20 years ago while in town for some Park City skiing. 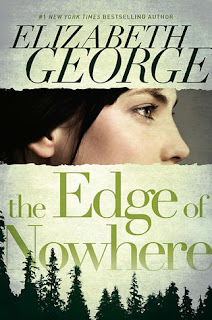 On Wednesday, September 12th at 7 PM she returned to TKE for the signing of her first young-adult novel, The Edge of Nowhere. Heather, from Fire and Ice, interviewed Elizabeth about her breaking into the teen scene. George is best known for her adult novels set in Great Britain. She ‘s been writing them for over 25 years, the first book having been published in 1988. Elizabeth had just finished the second draft of her 19th English crime novel when her novels were picked up and made into a BBC TV series which now airs all over the world and ranks among the top ten best sellers. Interestingly, The Kings English had sold over 800 copies of her Lynly novels, and now Mrs. George has a new novel for the young adult set in the United States. Like the rest of her books, The Edge of Nowhere has a large cast of continuing characters — some major and some minor.The main character is Becca King, who flees with her mother from San Diego to Puget Sound after she hears a “whisper” in the mind of her step-father. Becca possesses an unusual, undeveloped talent — one that is also a curse. Her ability to hear the incomplete thoughts in the minds of others has been inherited from her grandmother. Ferries in Washington are very big and this one happens to have a cafeteria. In the line, she sees a young girl — 5’2” and very tough. When Becca catches her trying to cheat the cashier, the two girls have an instant enmity, which brings the introduction of the third character, a girl named Jen. The final main teen character is Seth. The author feels it’s important to show the ability for men and women to be friends and nothing more. Seth is the friend-interest of Becca, a gypsy guitarist who has dropped out of school because of a learning disability. Becca, Seth, and Derric wander into the forest, Derric takes a very bad fall, sustains a head injury, and goes into a coma. The crux of the mystery in the story is about what actually happened to Derric — did he fall, was he pushed, and (if so) who did it ? Tell us a little about Whidbey Island. What makes it the perfect setting for this novel? Do you have any photos to forward on to the reader, or a favorite site to reference about the setting for your book? Why do you think adults are so important in young-adult literature? What books or projects are you currently working on? “I’m completing the second draft of the complete rewrite (argh) of the second young-adult novel which called The Edge of the Water. Tell us about your foundation. Best literature you’ve read or young adult books you would recommend to others? “Now that I’ve discovered that To Kill a Mockingbird is considered a young-adult novel, there can be no better book to recommend to young adults than that one. I have read it at least ten times and I have gotten something new from it with each reading. It is my vote as ‘Best American Novel’….Ever. Whidbey Island may be only a ferry ride from Seattle, but it’s a world apart. When Becca King arrives there, she doesn’t suspect the island will become her home for the next four years. Put at risk by her ability to hear “whispers”–the thoughts of others–Becca is on the run from her stepfather, whose criminal activities she has discovered. Stranded and alone, Becca is soon befriended by Derric, a Ugandon orphan adopted by a local family; Seth, a kindhearted musician and high school dropout; Debbie, a recovering alcoholic who takes her in; and Diana, with whom Becca shares a mysterious psychic connection. This compelling coming-of-age story, the first of an ongoing sequence of books set on Whidbey Island, has elements of mystery, the paranormal, and romance. Elizabeth George, bestselling author of the Inspector Lynley crime novels, brings her elegant style, intricate plotting, incisive characterization, and top-notch storytelling to her first book for teens. About The Author: Susan Elizabeth George is an American author of mystery novels set in Great Britain. Eleven of her novels, featuring her character Inspector Lynley, have been adapted for television by the BBC as The Inspector Lynley Mysteries. She was born in Warren, Ohio, but moved to the San Francisco Bay Area when she was eighteen months old. She was a student of English, receiving a teaching certificate. While teaching English in the public school system, she completed an advanced degree in psychology. Her first published novel was A Great Deliverance in 1988, featuring Thomas Lynley, Lord Asherton, a Scotland Yard inspector of noble birth; Barbara Havers, Lynley’s assistant, from a very working-class background; Lady Helen Clyde, Lynley’s girlfriend and later wife, of noble birth as well; and Lynley’s friends Simon and Deborah St. James. Special thanks to Rachel at the King’s English for arranging our one on one interview. All photos copyright Heather Gardner Photography.